“Slick Vic” Reno is the latest owner of the popular dining venue “Headlights”, a restaurant that used to be in the possession of heroine Ms. Metrobay before she was brainwashed into signing it over. 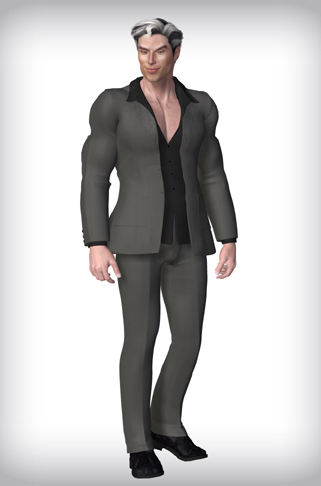 A respected member of the Circle of R.O.P.E., Vic brings a much-needed sense of style and class to the organization as well as a savvy business swagger that has often netted him his heart’s desires all through his life. Vic has two loves in his life: hot rods and hotter girls. He redesigned Headlights to showcase these passions and has begun the process of hiring attractive waitresses to bring in the customers, includingCarla Bello and Penny Nichol. Using greentooth earpieces, he has enslaved his staff of attractive works to serve and service his clients with mindless dedication. When superheroine Brown Sugar was sent by Ms. Metrobay to investigate his holdings, he took the opportunity to enslave her as well, though he remains unaware of her true superhero status. He appears to have a very strong relationship with Ginger Monroe and does nothing to hide his attraction to her. He also appears to be good friends with Max Indeks, no doubt due to their shared interests and common membership in R.O.P.E.